Soft Skull Press, 9781593766573, 250pp. 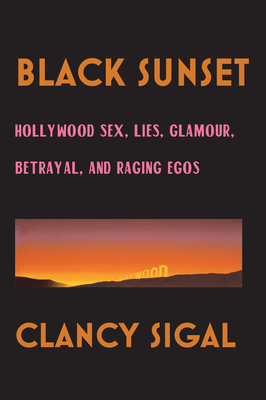 This a hilarious memoir of Clancy Sigal's escapades as a young Hollywood agent on the Sunset Strip, peddling writers and actors in a blacklist-crazed "golden age" movie industry of the 1950s. Atom bomb tests light up the night sky, and everyone is either naming names or getting named in the McCarthy witch hunt. By day a fast-talking salesman, at night he's the point person of a small circle of anarchistic oddballs. He's dogged by two FBI agents who want to be set up with starlets and have a screen test. They trail him as he goes from studio to studio hustling clients like Humphrey Bogart, Donna Reed, Jack Palance, Peter Lorre and Stanwyck. Barred from a studio he brazenly uses a bolt cutter to break through the chainlink fence to make a deal. Black Sunset's riproaring ribald style belongs to a hardboiled school that includes Elmore Leonard and Raymond Chandler. He is one of the few remaining witnesses and reporters of this absurd and terrifying time. Clancy Sigal is the child of a love affair between two idealists. His parents Leo Segal and Jennie Persily (Leo s mistress) were both labor organizers. Jennie, a single mother, raised Clancy on her own, with a mostly absent father. After a stint in the army Sigal he arrived as an immigrant in Great Britain, where he met and commenced a four-year affair with the writer Doris Lessing. Leaving Britain he relocated to Hollywood where he worked as an entertainment agent and activist. Currently he lives in Los Angeles with his screenwriting partner and wife Janice Tidwell, their son Joe and two Australian shepherd dogs Kelly and Lucky.